Although they passed few significant new policies and only a modest supplemental budget, lawmakers in Olympia did manage to improve their roll call record this year, according to a new report by WashingtonVotes.org. “Lawmakers finished this year's short 60-day session on time," said WashingtonVotes director Franz W. Gregory. "And, in terms of voting activity, accomplished a lot." In the 2014 regular session, 1,372 bills were introduced and 237 measures were passed. Ninety legislators maintained a perfect roll call record — up from 53 last year — and only three missed more than 50 votes. 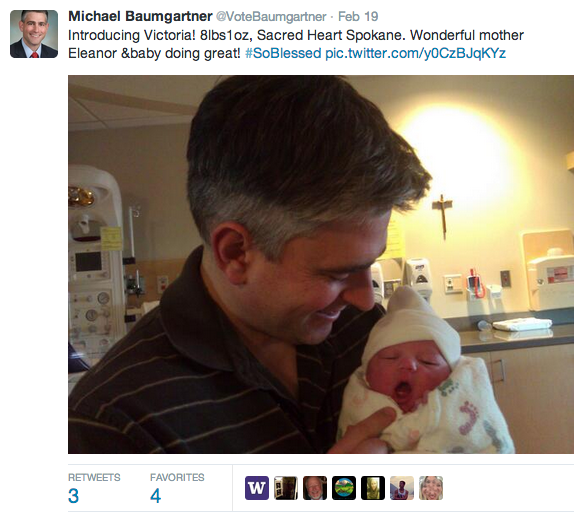 Among the lawmakers who missed the most votes was Sen. Michael Baumgartner, R-Spokane. He missed 87 votes — more than any other senator this session. But his excuse is pretty good (and super cute). Rep. Kevin Parker, R-Spokane, missed 25, including a vote on the "Real Hope Act," the Senate's version of the DREAM Act allowing undocumented students to apply for state college aid. Here's how our other local lawmakers' voting records compared: Sen. Mike Padden, Rep. Timm Ormsby, Rep. Marcus Riccelli and Rep. Matt Shea didn't miss any votes. Sen. Andy Billig missed two. Explore WashingtonVote's database of lawmaker voting records here.